NEW BENJAMIN MOORE REVERE PEWTER PAINTED EXTERIOR COMING NEXT WEEK! UPDATED PICS WILL FOLLOW. This delightful Berkley Estates 3 bedroom, 2 bath property features a second-story loft perfect for art studio, game room or office. Vaulted ceilings and beautiful woodwork throughout. Brick fireplace and built-in shelves adorn the living area with French doors leading to the backyard. No need to share closet space in the master bedroom with two separate walk-ins. Sellers will consider carpet allowance in master bedroom. En-suite master bath includes jacuzzi tub, enclosed/walk-in shower and double vanity sinks. Split bedroom house plan. Kitchen cabinets have received a fresh facelift. Washer and dryer combo stays in utility room. Carpet in secondary bedrooms and loft replaced 2015. AC unit replaced 2013. 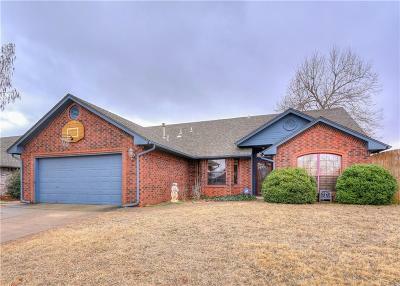 Tour this home today and experience the quiet, friendly neighborhood in Mustang Schools.